Brown steak in a frying pan or skillet. Add steak, potatoes, onion, rosemary and peppercorns to a slow cooker. Cover with a little water - just enough so the pot doesn't boil dry. Set on high and cook for around 2 hours until the beef is tender and potatoes are softened. Drain off the liquid and leave pasty mix to cool. Flour your work surface and roll out your pastry, cut into desired number of pieces. Add filling, wet the edges with water, fold, trim and pinch the edges. 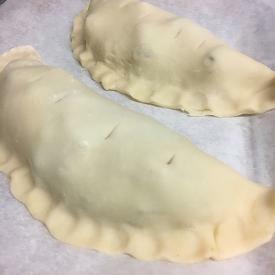 Make air holes in the top of the pasty with the point of a sharp knife. Put a splash of milk into a cup and brush over the pasty. I used a ready made dough and I made the filling the day before. 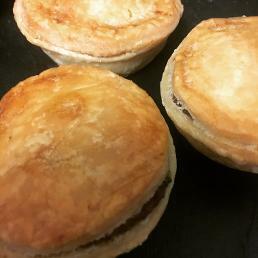 If you have leftover filling and dough you can make mini pies using a cupcake tin. Give the filling a quick whizz in a blender, to break down the meat and potatoes. Don't over blend as you don't want a purée. Roll out your leftover pastry pieces, cut out into circles. Line moulds with a piece of pastry, add filling, top and seal with a second piece of pastry.